Director Peter Jackson says that Fry's performance will be "memorable." 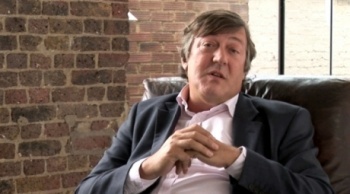 Actor, comedian, and writer Stephen Fry will appear in Peter Jackson's movie adaptation of the The Hobbit. Fry will play the Master of Laketown, the elected leader of the trading settlement that is decimated by the dragon, Smaug. Writing on his Facebook page, Jackson said that he had known Fry for many years, having worked with him in the past on a Dambusters project. He called Fry a "terrific actor," and said that Fry would make a very memorable Master. In the book, the Master of Laketown is a capable, if cowardly leader. After Bard the Bowman kills Smaug, he gives much of his share of the dragon's treasure to the Master, with the intention that it would be used to rebuild the town. Unfortunately, the Master's greed gets the better of him, and he flees the town, taking the gold with him. Also joining Fry are Ryan Gage, who will play the Master's servant Alfrid, and Conan Stevens as the orc chieftain, Azog. Gage was originally going to appear in a minor role as Drogo Baggins, but Jackson apparently liked his performance so much, he gave him a bigger part. Stevens is probably best known for playing Gregor Clegane in HBO's Game of Thrones series, oh, and for being more than seven feet tall. The first part of The Hobbit hits theaters in December of 2012, with the second part following a year later.